I love the decoration for his office. It was better this time around than it was when he was acting manager for seven hours. I love the Mose/Dwight portrait and his little Battlestar Galactica model. There were some inaccuracies in this episode though, in addition to spelling Pam’s maiden name incorrectly. All kind of surprising given their usual increased level of attention to detail and continuity. Great pictures, thank you. That messianic portrait (#7) looks familiar, i was thinking there was a similar one of Mao or Kim Jung Il, but i can’t find one. Any ideas? 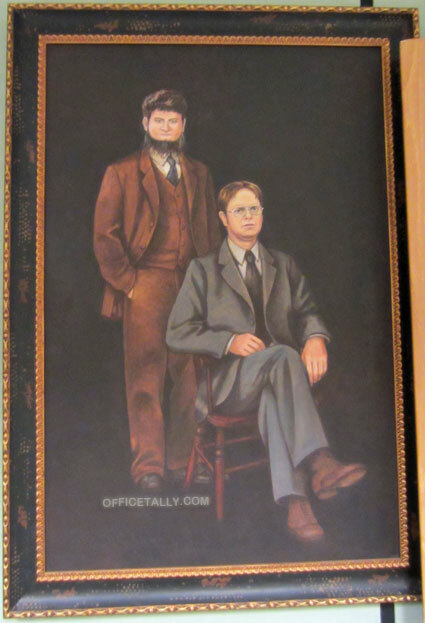 Absolutely love the portrait of Dwight and Mose. Going to miss them so much. Those portraits are incredibly awesome. I’m very impressed that they went to such lengths to do all of the decoration for only two episodes at the very end of the show. #4, it’s similar to Chairman Mao’s propaganda. There are pictures of him in that same pose with sunbeams in the background haha. Love these decorations! These pictures make me wish this was the first time Dwight occupied that office! Still, great. Love the pictures, and yes, I am pleased with the plot! I absolutely need to own a replica of this Dwight painting….it’s awesome!!! I browsed the NBC STORE and Amazon but nada….anyone know if you can get one anywhere..Please?